Our body of choices this weekend wound up spindle-legged, to put it mildly. Taking it all in stride, though a warbling one, here are the results. Maywood’s quartet of stakes on Nov. 16 were favorite-laden and two we thought unbeatable did not get beaten, as well as they didn’t pay much. Our Dragon King (second photo below from Maywood) won his second race in a row, only when we gave him to you last week and he won, his win price reflected odds of 22-1. We chose him again in the Abe Lincoln, he won, but this time he returned $5.80. Market Share (left picture from Maywood) broke the $2-million earnings plateau when he won the Galt Stake, paying the minimum $2.10. Our other choices were in the mix, as Dynamic Youth finished second and Blackjack Princess got third. At Western Fair on Nov. 17 the 1-9 choice won the Forest City Pace Final, leaving our outside contender, Tea Party Princess, in the dust. Sunday’s stakes at Dover didn’t offer much but choices—with some exceptions. As no luck would have it, we went to post solidly with All Laid Out offering a generous 7-2 but the colt broke at the start and was distanced throughout. A 12-1 shot that could only have been chosen by eliminating All Laid Out, in our opinion, won. Ma Chere Hall was a clear wager at 6-1 but the first two choices shared the exacta. We all had Somwheovarainbow or we passed and she won, paying $2.40. 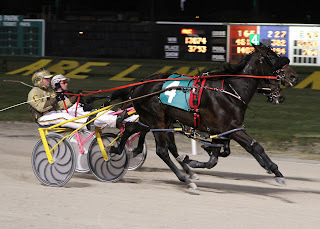 Superstar Hanover was defeated at 16-1 by the favorite. Sir Richard Z Tam was our choice because we were very sure that Twilight Bonfire would be a huge favorite. That one went off at 4-1, a very fair overlay that was unpredictable at press time. He paid a shocking $10.80. We hope you saw the value and went off of our mistakenly evaluated choice. Guccio won again? How is it that Googoo Gaagaa has been so lifeless, even in outside trips? This was another favorite losing for us. But Guccio only paid at 5-2. And the Progress Pace went to the uber-choice, Heston Blue Chip, while our last hoorah for Sweet Lou tanked at 6-1. Finally, Shelliscape lost to favorite Darena Hanover. Malabar Millennium, son of Hambletonian-winner Malabar Man, has died of cancer at the age of 12. 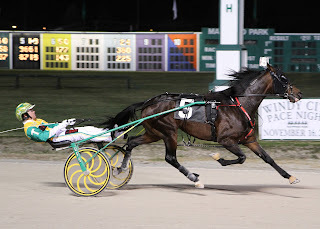 As a two-year-old he was aimed at harness history. His sire was owned, co-trained (with Jimmy Takter, then new to the states) and driven by Mal Burroughs, who had an amateur driving license. He steered Malabar Man to all of his victories at two and three, including the August classic. Burroughs also owned, trained and drove “Millennium” and put that colt on the same path to the Hambo. Had Millennium gone all the way he would have been the first offspring of a former winner to win with the same connections and driver as his sire. As it turned out, Burroughs was unable to drive Millennium, who won a Hambo elim but finished sixth in the final. Millennium went to stud in 2004 but had fertility problems and only bred a small amount of mares. Somebeachsomewhere, sire of Captaintreacherous, has been the top draw of yearling buyers this season. He has done so well that Jim Simpson, the President of Hanover Shoe Farms and the syndicate manager of the stallion, announced the horse will stand the 2013 season at a stud fee of $20,000. His 2012 fee was $15,000. His first crop were now two-year-olds this year and he has done what no other sire in the history of harness racing has accomplished. His frosh products have earned a record $4,642,586. He has sired great fillies as well as colts. His fillies have earned an astonishing $2,603,799. The Meadowlands Racetrack will hold 82 harness racing programs in 2013. The principal meet begins Friday, Dec. 28, and runs through Saturday, Aug. 3. Racing is slated for three nights a week, Thursday–Saturday, through March 16. The schedule then changes to Friday and Saturday until the Championship Meet finale on Hambletonian Day, Aug. 3. Fall harness racing returns to the Meadowlands in 2013 with a brief engagement from Nov. 23–Dec. 28. Meanwhile, the first columns of steel have been raised for the new grandstand at the Meadowlands. The 155,000 square-foot building is expected to open in late 2013. It’s a large part of track-operator Jeff Gural's plan to reinvigorate harness racing at the track. Approximately 50 pieces of steel a day will be set by mid-February 2013, the estimated topping off date, for a total of 2,200 tons. Two-dozen tradesmen are currently working working daily on the project.